The SR-04W statistical multiplexer concentrates 4 asynchronous channels over a single radio link. All port parameters are set with an asynchronous terminal connected to the network management port or port 1. Set-up procedures are menu driven and fully explained on screen. All configuration parameters are battery supported through power outages. The SR-04 composite is a wireless link that runs at 57.6 Kbps. It transmits on the 900 Mhz license-free ISM band. The link radio modules are easily configured using a terminal or PC connected to the network management port or port one. Range is 1000 feet indoors using supplied antennae or up to 15 miles with optional external antennae. The network management port includes local and remote configuration commands. The Show Configuration Commands allow the system manager to view the configuration settings of both the local and remote SR-04W Multiplexers. Network management features include port and composite loopbacks, capture of a remote or local port, send a test message to an individual local or remote port, set multiplexer ID for node identification and a built-in "data line monitor" which allows the monitoring of the transmit or receive lines at the local multiplexer. 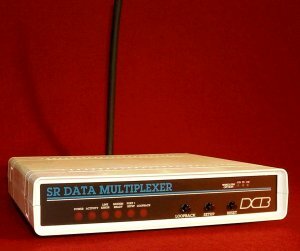 A unique feature of the SR multiplexer is the Copy Command. This command allows a trainer at the host site to "copy" any local or remote port to view exactly what the user is entering. This feature can save thousands of training dollars by eliminating travel expenses. The SR-04W multiplexer has a side panel access for firmware cartridge installation. This feature simplifies installation of upgrades for new features and functions. The SR-04W is compatible with virtually all async terminal-printer/computer links. You can save thousands of dollars by concentrating your terminals on one wireless link while delivering top performance. In addition, with features like the loopback, test message, ID, monitor and copy commands, you can take charge of your network like never before. 101/4" x 93/4" x 21/4"